I never saw my husband John run so fast. Arms were pumping and his legs jogging like he was at the Running of the Bulls. There was no threat of getting gored, just the fear of reaching the Seven Dwarfs Mine Train and standing in a 110 minute line for a three minute roller coaster ride. John, our son Shawn and I were one of the first hundred people to arrive at Magic Kingdom before the dapper dancers with parasols and straw hats waved and sang welcome. We lined up like we were cattle shuffling to the slaughter house. Down we ran Main Street, ignoring the waving Mickey and Minnie and nearly trampling a woman with a Tinker Bell tattoo on her neck. We veered to the left side of Cinderella’s castle and the carousel already spinning with children. As we continued through Fantasy Land we saw a human tsunami crashing toward Seven Dwarf’s Mine Train. 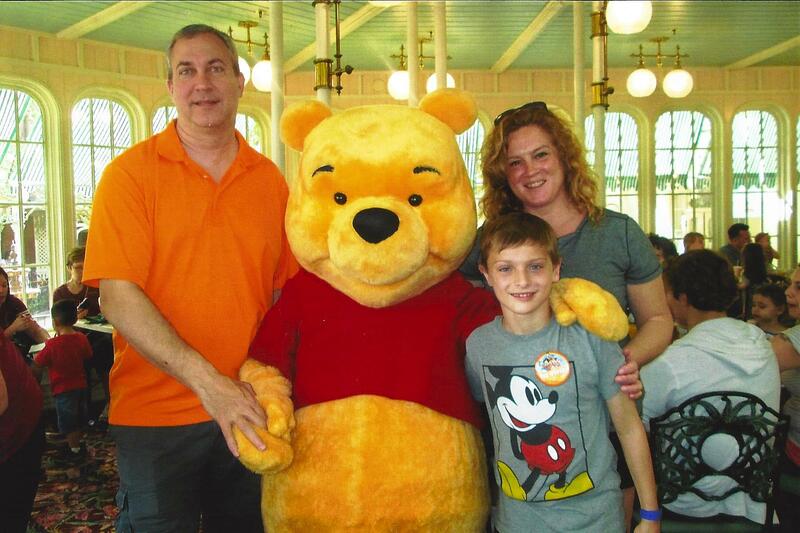 We posed with Winnie the Pooh and I wondered what the going rate was for his autograph? Grown women waited patiently for Pooh, Tigger, Piglet and Eeyore to sign stacked autograph books. Who was in those furry costumes; a junior from University of Florida getting real world experience? Strollers commandeered huge sections of the park while parents indoctrinated their infants to the creator Walt Disney and his savior Mickey Mouse. It’s a Small World christened these Disney neophytes in the church of all things magical. Everyone wore Mickey Mouse ears, women donned red and white polka dot manicures, extended families walked in packs wearing matching Goofy t-shirts announcing their 17th annual visit. Snow White, Sleeping Beauty and Rapunzel attracted crowds and long lines just to get a photograph with the happily-ever-after-gals. I tried to look beyond the long lines and humid weather to find the magic I was promised. I discovered that the magic wasn’t in the parades or the fireworks or even the smiling, frantically waving furry characters. The magic was in my son, Shawn. 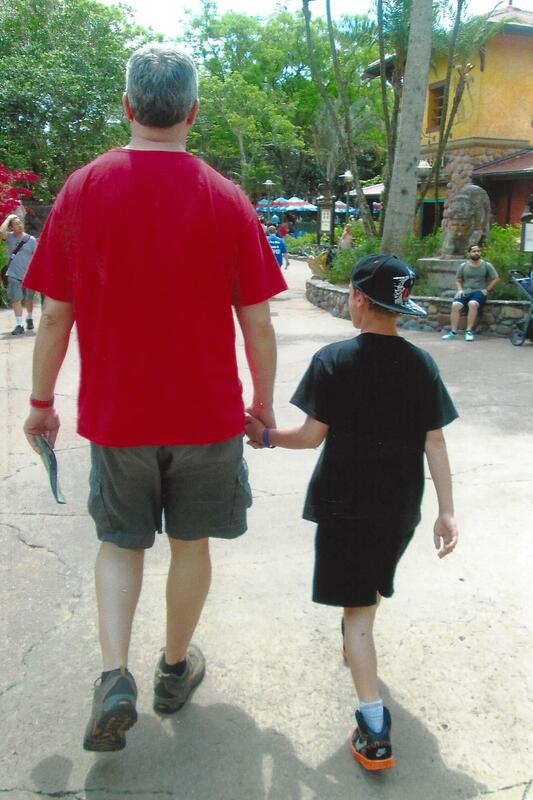 The magic was John and Shawn, holding hands as they headed to Expedition Everest for the fifth time. Even John got misty eyed over the animation montage that illuminated the castle one evening. 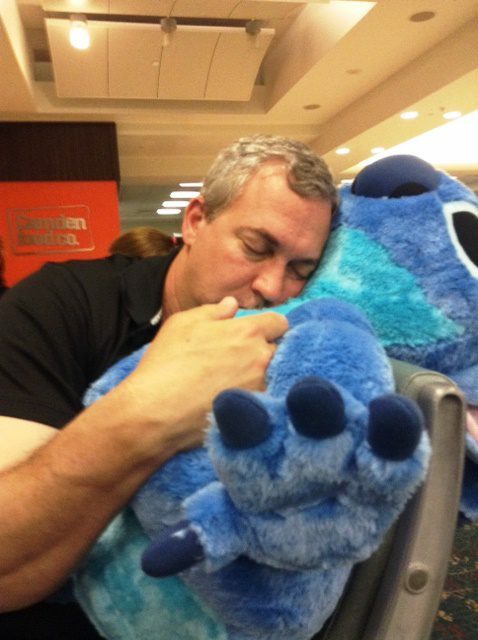 And when the week was over, and the days of heat, crowds and logistics were memories, John snuggled with the giant stuffed Stitch while we waited for our 5:10 a.m. flight back home. Hope shawn had a awesome awesome time…. I had a amazing time when I went! Love the stitch! I am glad that Shawn has inherited the normal Disney loving DNA. His cousin is looking forward to joining him sometime on a road trip from Savannah. It has to be in the blood. I’ve drank the kool-aid. Beats a mani-pedi hands down!!! Shawn has to make up for not going at the age of 5, so you need to book him a trip next year. He will be just fine without you and John. Love you, Shawn. Brenda, I really enjoy your writing , very sweet!